In order to explain the various components of Chiari malformation, it is helpful to describe a few parts of the brain and their functions. There are four major regions of the brain affected in Chiari malformation: the cerebellum, the brain stem, the ventricles, and the cerebrum. The cerebellum is located at the base of the skull and is divided into two parts or hemispheres with a third section that connects the hemispheres. Its main purpose is to coordinate body movements. The brain stem is located in front of the cerebellum and is composed of two parts. It regulates involuntary actions the body must conduct to survive, such as breathing, swallowing, and blinking the eyes. There are four ventricles in the brain. They are located above and in front of the cerebellum, and their function is to produce and circulate cerebrospinal fluid (CSF), the protective fluid that circulates through the brain and the spinal cord. The cerebrum is the largest part of the brain and is divided into two halves or hemispheres as well. It is located above the cerebellum and is responsible for the higher functions of the brain, such as thought. In Chiari malformation, one or more of these parts of the brain function improperly or are malformed. In addition to brain anomalies, Chiari malformation can also involve defects in the base of the skull and in the bony part of the spine. There are four types of Chiari malformation. In Type I malformation, the lower portions of the cerebellum, known as the cerebellar tonsils, protrude through the opening in the skull known as the foramen magnum and into the spinal cord canal. It is often accompanied by a condition known as syringomyelia in which pockets of CSF form in the spinal cord. This type is usually diagnosed in adolescence or early adulthood when symptoms most commonly appear; however, with the availability of magnetic resonance imaging (MRI), many children are diagnosed at a much younger age. Type II malformation, sometimes called Arnold Chiari malformation, is more severe than Type I and involves herniation of a more significant part of the cerebellum, part of the fourth ventricle, and parts of the brain stem. The brain tissues protrude farther into the spinal column than in Type I. These malformations are part of a larger syndrome seen in children with spina bifida , a condition in which the spine and spinal cord have not formed properly. Approximately 80–90 percent of children with Chiari malformation Type II also have hydrocephalus , a condition in which one or more of the ventricles becomes enlarged due to an accumulation of CSF. In these children, hydrocephalus is caused by obstruction of the fourth ventricle due to its herniation into the spinal column. Type II Chiari malformation may be diagnosed prenatally by ultrasound or shortly after birth during medical evaluation of the accompanying spina bifida. In Type III malformation, parts of the cerebellum and the brain stem protrude into a spina bifida defect located at the base of the skull, on the neck. Type III malformation occurs rarely. Some neurologists do not consider it a Chiari malformation but rather a specific type of spina bifida called an encephalocervical meningocele. Type IV malformation consists of an underdevelopment of the cerebrum and involves no herniation of brain tissue into the spinal area. As with Type III malformation, many neurologists do not consider this a Chiari malformation but rather cerebellar hypoplasia (underdevelopment). Both Type III and IV Chiari malformations are extremely rare, and this term is not often used in diagnosis of these conditions. The remainder of this entry only discusses Chiari malformation Types I and II. 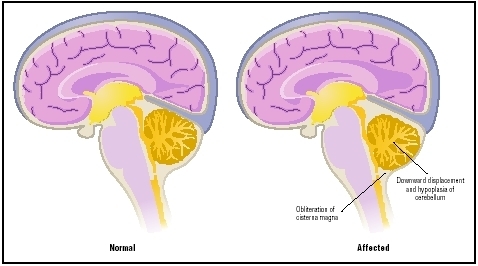 Comparison of normal brain (left) with brain affected by Arnold-Chiari malformation. more cases of Type I malformation, in particular, than reported since many individuals with Type I malformation experience few if any symptoms. Most researchers agree that the rate of both Type I and Type II Chiari malformation is approximately 1 percent of all live births. Of those with Type I malformation, approximately 25 percent also have syringomyelia. However, the majority of all Chiari malformations are Type II and are almost exclusively associated with spina bifida defects. Spina bifida occurs in approximately one to two per 1,000 births. As access to imaging testing such as MRI has increased, so has the number of children diagnosed with Chiari malformation Type I. Therefore, the incidence of known Type I Chiari malformation is anticipated to increase. All Chiari malformations are present at birth, though symptoms may not begin until years later. The exact cause is unknown; however, it is suspected that, at some point during embryonic development, an increased pressure in the brain may cause brain structures to be displaced or moved into the spinal canal. Other possible causes for this malformation include exposure to harmful substances during fetal development or genetic factors. In general, there are several accepted theories of what may lead to problems that affect normal development of the brain: exposure to toxic or harmful substances; a lack of proper vitamins and nutrients in the mother's diet during pregnancy; infection; maternal use of prescription medication, illegal drugs, or alcohol; and genetic or familial factors. Chiari malformations are found in several known genetic disorders such as achondroplasia, Hadju-Cheney syndrome, and Klippel-Feil syndrome. Similarly, studies of families and identical twins with Chiari malformation show that the malformation occurs more often in these families than in families in which no member is affected. Another proposed cause for Chiari malformation is an abnormality in bone development. Chiari malformation may result because the cerebellum is of normal size, but the bones at the base of the skull are too small. Symptoms of Chiari malformation vary according to the type of malformation. In Type I Chiari malformation, symptoms may begin anytime between infancy and early adulthood. Depending on when it is diagnosed, these symptoms may include blurred or double vision; involuntary eye movements; headache , usually at the base of the skull or upper neck which may become worse with coughing or straining; scoliosis or an abnormal curvature of the spine; dizziness and impaired muscle coordination; low muscle tone; alteration of the voice or a high-pitched cry; frequent respiratory tract infections, vomiting and difficulty swallowing; drop attacks (a sudden loss of muscle control that results in a collapse to the floor); and central cord syndrome, a pattern of reduced sensation and weakness in the arms. Symptoms of Type II Chiari malformation include those that occur in Type I malformation. Victims may also exhibit vocal cord paralysis and episodes of apnea (a cessation of breathing sometimes requiring resuscitation). Type II malformation occurs almost exclusively with spina bifida, which causes symptoms that may include paralysis of the lower extremities (and less often, the upper limbs), and bowel and bladder dysfunction. If the child has hydrocephalus, these symptoms may worsen and can be fatal unless the hydrocephalus is treated. In some children Chiari malformation is evident at birth, especially Type II malformation. Type I malformations may have no symptoms for years. When symptoms are present, they may be very subtle. A complete medical history and physical exam will be conducted by the physician. If the doctor suspects a Chiari malformation, magnetic resonance imaging (MRI) is the most helpful diagnostic tool. MRI is a diagnostic procedure in which high-powered magnets, radio frequencies, and computers are used to produce detailed images of structures within the body. It is painless, noninvasive, and allows doctors to see the brain and spinal cord from several different angles. A computed tomography scan (CAT scan) may also be performed. In this imaging procedure, a combination of x ray and computer technology produces cross-sectional images of the body. This procedure is most helpful in assessing abnormalities of the skull and backbone associated with Chiari malformation. Ultrasonography (ultrasound) is also routinely used to evaluate the fetus before birth and in the period shortly after birth. Ultrasonography is a diagnostic procedure in which ultrasonic waves are used to visualize internal organs. This procedure is commonly used for diagnosis and follow-up care of hydrocephalus. The prognosis for Chiari malformation varies depending on which type of malformation is present. For children and adolescents with Type I malformation, corrective surgery may be highly effective at relieving symptoms related to compression of the brain, such as vision problems; headaches; difficulties with balance, coordination, and swallowing; and frequent respiratory tract infections. Symptoms related to the fluid-filled sacs in the spine may be less responsive to surgery. Scoliosis will most likely stabilize and may improve in a significant portion of patients. Central cord syndrome, however, is less successfully corrected by surgery with only about one third of patients experiencing lasting improvement. Generally, in those with Type I Chiari malformation, younger children experience the most benefit from surgical interventions, and approximately 78 percent of all patients who have surgical procedures to correct the malformation have a better outcome than those who have no surgical intervention at all. Some patients may continue to experience neurological symptoms, but the long term prognosis for children with this type of Chiari malformation is excellent, including normal development and intellectual functioning. The majority of all Chiari malformations are Type II. Children with Chiari II malformation have a much poorer prognosis than those with Type I malformation. Because of the associated conditions of spina bifida and hydrocephalus, these children are usually quite ill. Multiple surgeries are required, and almost 50 percent of these children die at an early age. Of those who survive, many have developmental delays and impaired intellectual functioning. Chiari malformation is a congenital anomaly, and no method of prevention is known. Chiari malformation can have a significant impact on both the child and the family . The full extent of problems associated with Chiari malformation may not be evident at birth, especially for children with Type I malformation. Children with Type I malformation may experience months of subtle but progressive symptoms before a diagnosis is made. Parents must play an active role in securing appropriate health care and an accurate diagnosis for their child. The symptoms of Chiari Type I malformation when observed individually may not seem significant. However, these symptoms form the basis of the initial diagnosis. Parents should document all unusual events their child experiences such as dizziness, headaches, slurred speech, fainting spells, and numbness or pain in the arms and legs. The first step for diagnosing Chiari malformation Type I is an accurate and detailed history and physical examination. Following this, an MRI is performed. The MRI usually provides a definitive diagnosis and helps determine if the child is a candidate for decompression surgery. Medical treatment is a multidisciplinary team effort often involving the pediatrician, a neurosurgeon, a rhematologist, and a neurologist. Once diagnosed, the child and family face the prospect of surgery and recuperation. A child will typically be hospitalized for four to seven days after surgery. The prognosis for children with Chiari malformation Type I is very good. Over 70 percent of those who have surgery to correct Type I malformation experience a significant reduction in symptoms; however, there are some symptoms that may not resolve. There may be continued discomfort in the neck and lower head, and some muscle weakness may be permanent. Many children may also experience a recurrence of symptoms within two years of surgery. For this reason, parents must continue follow-up treatment and care for at least two years following surgery. The availability of MRI technology has led to diagnosis of younger children with Type I malformation and improved the quality of life for these children. The earlier treatment can begin, the better outcome these children experience. Brain stem —The part of the brain that is continuous with the spinal cord and controls most basic life functions. It is the last part of the brain that is destroyed by Alzheimer's disease. Catheter —A thin, hollow tube inserted into the body at specific points in order to inject or withdraw fluids from the body. Cerebrum —The largest section of the brain, which is responsible for such higher functions as speech, thought, vision, and memory. Dura mater —The strongest and outermost of three membranes that protect the brain, spinal cord, and nerves of the cauda equina. Foramen magnum —The opening at the base of the skull, through which the spinal cord and the brain-stem pass. Herniation —Bulging of tissue through opening in a membrane, muscle, or bone. Hydrocephalus —An abnormal accumulation of cerebrospinal fluid within the brain. This accumulation can be harmful by pressing on brain structures, and damaging them. Neurologist —A doctor who specializes in disorders of the nervous system, including the brain, spinal cord, and nerves. Neurosurgeon —Physician who performs surgery on the nervous system. Rhematologist —A physician who specializes in the treatment of disorders of the connective tissue structures, such as the joints and related structures. Syringomyelia —Excessive fluid in the spinal cord. Syrinx —A tubular fluid-filled cavity within the spine. When discussing Chiari malformation and surgery with their child, parents should use words the child can understand. How illness and surgery are discussed depends on the age of the child. A younger child needs short simple answers, a school-aged child may understand more complicated explanations, and an adolescent will probably be present at all meetings with doctors and should be encouraged to talk to healthcare providers himor herself. Regardless of the age of the child, mental health experts agree that children should be told about medical procedures and surgeries before they occur. Depending on the age of the child, parents may choose to talk to him a day before or weeks ahead. The child may have questions. Parents can answer them simply and honestly. While a younger child may ask many questions, an adolescent may be reluctant to appear ignorant and may not express his fear or confusion. Parents should encourage an adolescent to discuss all concerns and should be prepared to explain and reassure. Many doctors and children's hospitals have brochures to assist parents when discussing illness and surgery with their child. Children with Chiari II malformation have a much poorer prognosis than those with Type I malformation and will usually be quite ill. Multiple surgeries are required, and many of these children die at an early age. All of these factors have a significant impact on the family. These children require multiple services, including surgery, physical and occupational therapy, and special education . Many have developmental delays and impaired intellectual functioning in addition to the physical limitations often caused by the accompanying spina bifida. Parents may need support services in addition to the team of healthcare providers. Many parents find it helpful to participate in a support group of other families of children with special needs. Most states and children's hospitals offer these services and know of organizations in the area that may help these families. Parents can work closely with the hospital's social work department to learn more about available resources. See also Hydrocephalus ; Spina bifida . Behrman, Richard E., Robert M. Kliegman, and Hal B. Jenson, eds. Nelson Textbook of Pediatrics , 16th ed. Philadelphia: W. B. Saunders Company, 2000. Parker, James N., et al. The Official Parent's Sourcebook on Chiari Malformation. Boulder, CO: netLibrary, 2003. Rudolph, Colin D., and Abraham M. Rudolph, eds. Rudolph's Pediatrics , 21st ed. New York: McGraw-Hill, 2003. "Chiari Malformation Presentation." Hyman-Newman Institute for Neurology and Neurosurgery. Available online at http://neurosurgery.org/chiari_presentation.htm (accessed July 29, 2004). Incesu, Lutfi, Anil Khosia, and Michael R. Aiello. "Chiari II Malformation." Available online at http://www.emedicine.com/RADIO/topic150.htm (accessed October 25, 2004). Siddiqi, Nasir H., and Fred J. Laine. "Chiari I Malformation." The American Association of Neurological Surgeons/Congress of Neurological Surgeons , March 15, 2004. Available online at http://www.emedicine.com/RADIO/topic149.htm (accessed October 25, 2004). i am 53 years old and I have just had surgery for chairi malformation on Dec 14th 2006, I am having a hard time, with dealing with the headaches and pain in my neck and head . Is this going to last forever or does it get better? My 17year old daughter had the chiari decompression surgery on June 14th 2006. She was doing great, until November she started having popping and grinding in her neck. What and why is this possibly happening, is it due to the surgery or what, I would love to hear from anyone who has had this happen. excellent article covering all the basic aspects of chiari malformations.. I had surgery for chiari II . I think that's the one I have. Had surgery on 11-14-05. Than they found out I had hydrocephalus so they but a shunt in, 01-5-06. I had to have surgery again because the fuild in my spinal code was increasing. He know has it where it does the best for the fuild in my spinal code but I have more headaches and get dizzy a lot more. But he doesn't want to ajust it because everything looks great on the MRI and Cat skans. He will not let me work a full time job. I have worked all my like and know this how do you deal with it? I filled for SS but have been turned down twice. I'm fifty now haven't worked in three years.I told my friends that I should not have had the surgery.